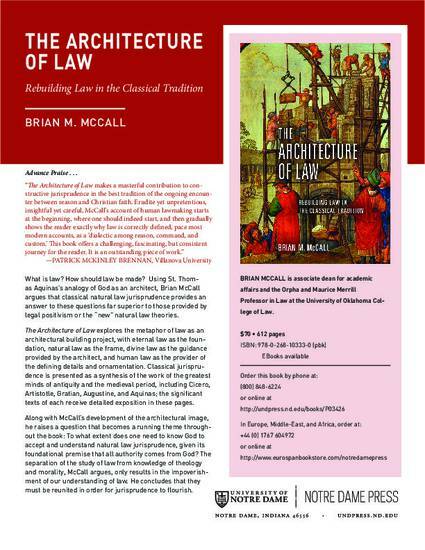 The Architecture of Law explores the metaphor of law as an architectural building project, with eternal law as the foundation, natural law as the frame, divine law as the guidance provided by the architect, and human law as the provider of the defining details and ornamentation. Classical jurisprudence is presented as a synthesis of the work of the greatest minds of antiquity and the medieval period, including Cicero, Artistotle, Gratian, Augustine, and Aquinas; the significant texts of each receive detailed exposition in these pages. Along with McCall’s development of the architectural image, he raises a question that becomes a running theme throughout the book: To what extent does one need to know God to accept and understand natural law jurisprudence, given its foundational premise that all authority comes from God? The separation of the study of law from knowledge of theology and morality, McCall argues, only results in the impoverishment of our understanding of law. He concludes that they must be reunited in order for jurisprudence to flourish.